The winter is not over just yet and there is still time to go outside and play with snow, or at least go for a walk and collect some happy thoughts and positive energy. Soft and warm clothes are very important in the winter, especially for kids. Their minds are usually everywhere else than to close the jacket, tied shoelaces or wearing a hat. Playing and having fun is always in the first place for them, so things like hats, mittens and shawls get lost all the time. 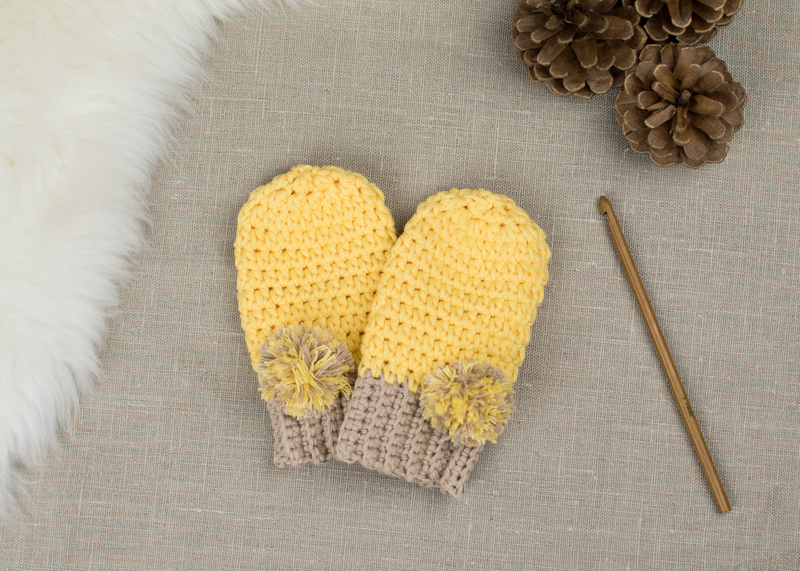 Today I am going to show you how to make a pair of crochet mittens for babies so you will always have an extra pair in case you need a new one, or if you need a super sweet gift for a baby shower or just because you like to have more than just one option when it comes to crochet mittens. This pair is made with a beautiful Paintbox Yarns Baby DK which is a new line of Paintbox yarns. For those who are familiar with my work, know by now how much I love Paintbox yarns, especially their selection of cotton yarns. Their yarns are high-quality yarns and are available in a great variety of different colors. Paintbox Yarns Baby DK lines is not an exception. It is available in 25 beautiful pastel shades, which is a bit less than Paintbox Cotton DK or Paintbox Cotton Aran but still more than enough to cover all your favorite crochet projects. The yarn itself is a blend of 45% acrylic and 55% nylon which makes it super soft, lightweight and elastic. The yarn does not shed and is machine washable. You can find the whole line of Paintbox Yarns Baby DK here. OTHER: And of course a yarn needle (HERE! ), stitch markers (HERE!) and a pair of scissors (HERE!). This pattern is written in two sizes: 0 – 6 months. GAUGE: 9 sts and 7 rows in HDC measure 5 x 5 cm or 2 x 2 in. Important: This blog post was updated in March 2018. There were no changes made in the pattern (stitches, gauge or stitch count), I refreshed all the photos of making the mittens and finished item. The instructions are written as a combination of crochet pattern and collection of my notes, tips and tricks, actually everything I’ve learned during making this pattern. 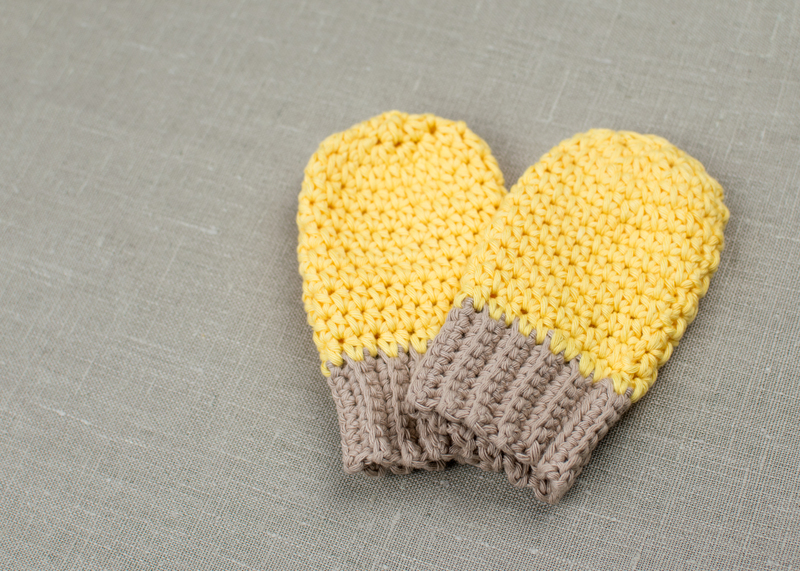 The mittens are super easy to make and can be finished in a very short amount of time. 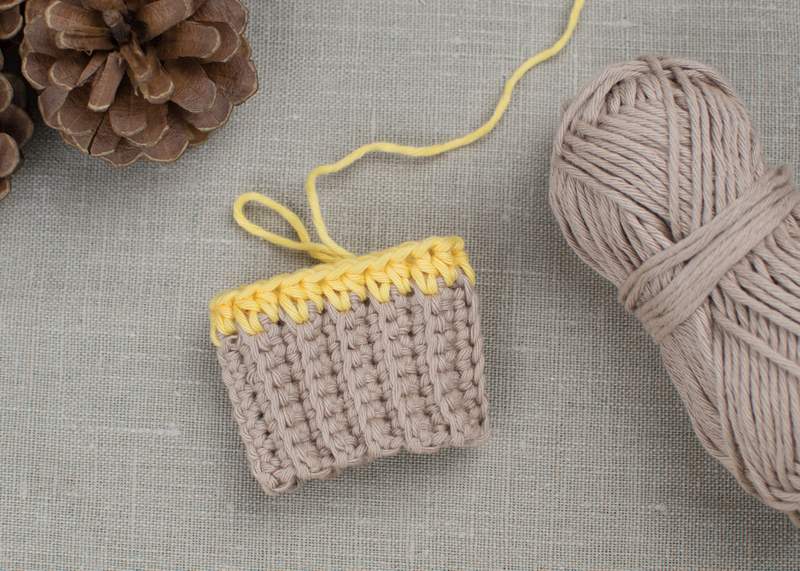 The pattern is made of three simple steps: ribbing, main part and pom-pom. 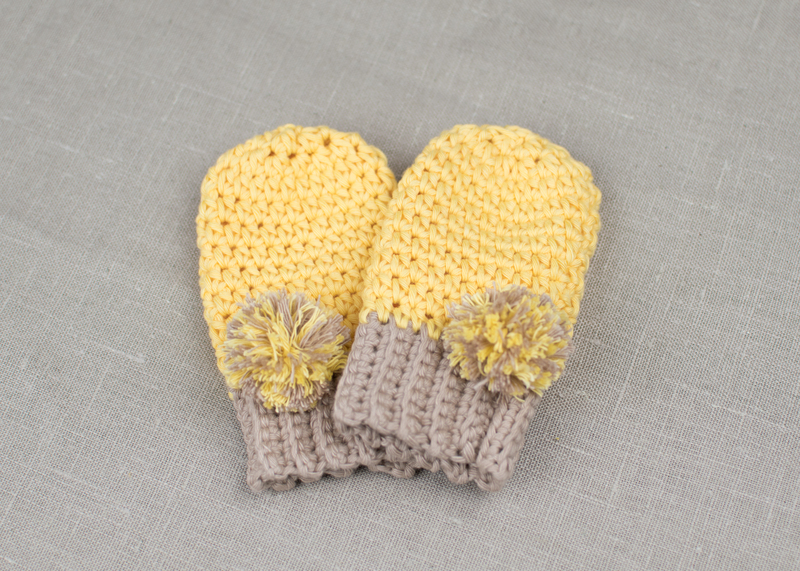 You will make two exactly the same crochet mittens. The location of the pom-pom and the fold of the mitten will indicate which mitten is left and which right. These mittens do not have a special pocket or compartment for a thumb, which is not a problem if you are creating baby mittens. But you might consider adding it if you are making mittens in a bigger size than for a six months old baby. The thumb is helping you when you holding something in your hands because it gives you more strength and control. We will start with the ribbing. The ribbing is made of single crochet stitches with a small twist. Each row is made into back loops only. If you are not familiar with that technique, jump to the video tutorial how to do that here. If I summarize it a bit, each stitch has two loops on the top, simple V shape or as some people like to call it a heart shape. You will see it if you watch your stitches from the top of your work. So, the loop closer to you is a front loop and the loop farther away from you is a back loop. 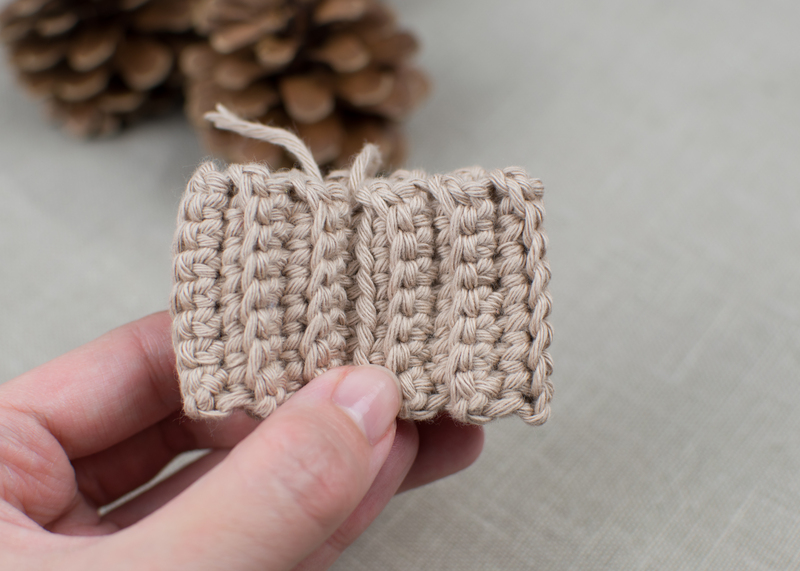 We normally use both loops, but as I mentioned before, we will crochet all the sts into back loops of each row only. Take some yarn in a color of your choice and chain 9. 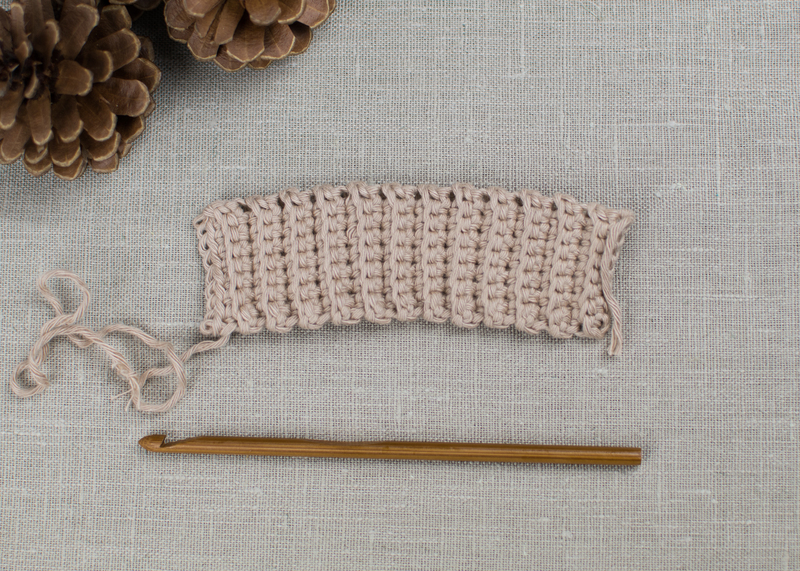 At the end of the foundation chain, turn and start in the second chain from the crochet hook. From now on work in simple rows. After each row chain 1 (chain will give us a proper hight of the row, but in cases like this doesn’t count as a stitch), then turn the row and start with the next one. Row 1: Work 1 sc into each of next 8 chains. Ch 1. = 8 sts. The following rows are all the same. Just work 1 stitch into each stitch all the way across. Don’t forget to work into back loops only, so you will get this beautiful ribbing effect. Row 2 – 24: Work into BLO. 1 sc into each st across. Ch 1. = 8 sts. Hold both ends of the ribbing together. Work 8 ss st through both ends of the ribbing at the same time. Cut the yarn and fasten off. Turn the ribbing inside out, so the seam will be hidden on the inner side of the mitten. 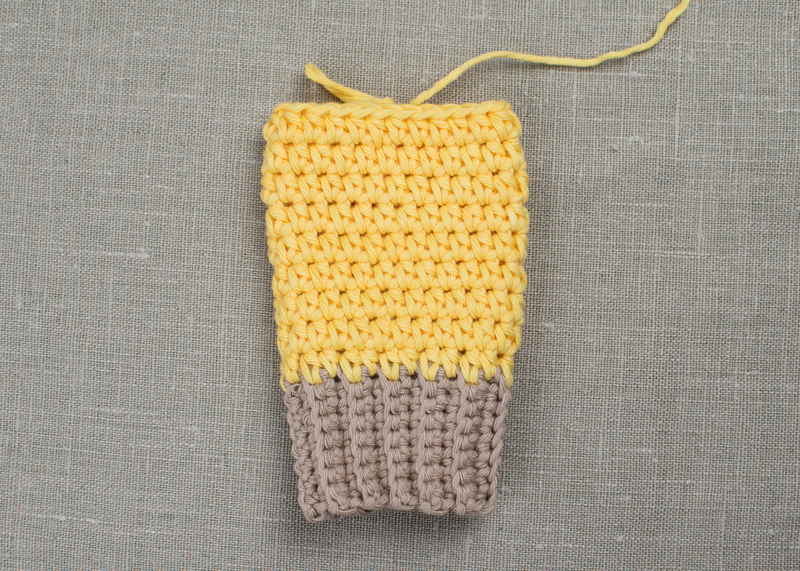 Take a yarn in a contrasting color and attach it to the ribbing with ch 1. From now, work in rows. 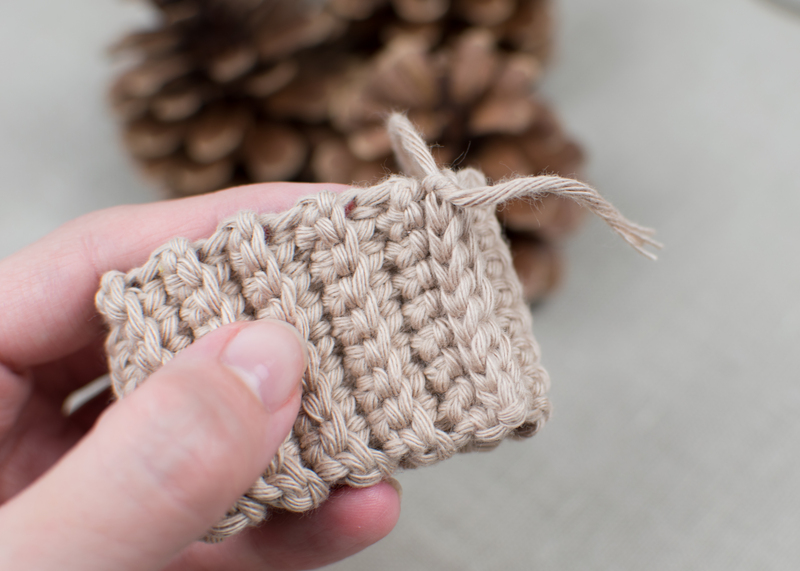 When you finish your last stitch of the round, join the round with a slip stitch made into the very first stitch of that round. Always start the round in the very first stitch of the round. The main part of the mitten is made in both loops which means you have to use both, the front and back loop that are on the top of each stitch and not only back loop as you did in the previous part (ribbing). Round 1: Start in the same stitch and work 1 hdc into each row from the ribbing all the way around. = 24 sts. Round 2 – 8: Ch 1. Work 1 hdc into each of next 24 sts. = 24 sts. If you want, you can cut the yarn, fasten off and change the yarn to make the top of the mitten in a different color, then make the rest of the main part as I did in the video tutorial. If not, just continue with round 9. Round 9: Work 1 hdc into each of next 24 sts. = 24 sts. Almost done. In the next round join two and two stitches together. Round 10: Ch 1. Repeat hdc2tog 12 times. = 12 sts. Round 11: Ch 1. Work 1 hdc into each of next 12 sts. = 12 sts. Round 12: Ch 1. Repeat hdc2tog 6 times. = 6 sts. Turn the mitten inside out. 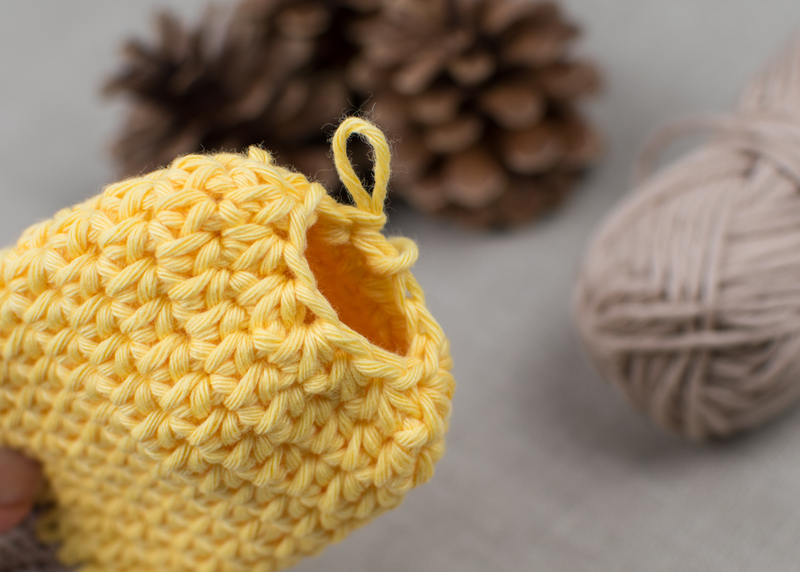 Now take the crochet hook and pull the yarn tail through the hole on the top of the mitten. Take a yarn needle and close the hole with a few simple stitches joining all loops from round 12 together. Secure the yarn tail between the stitches. 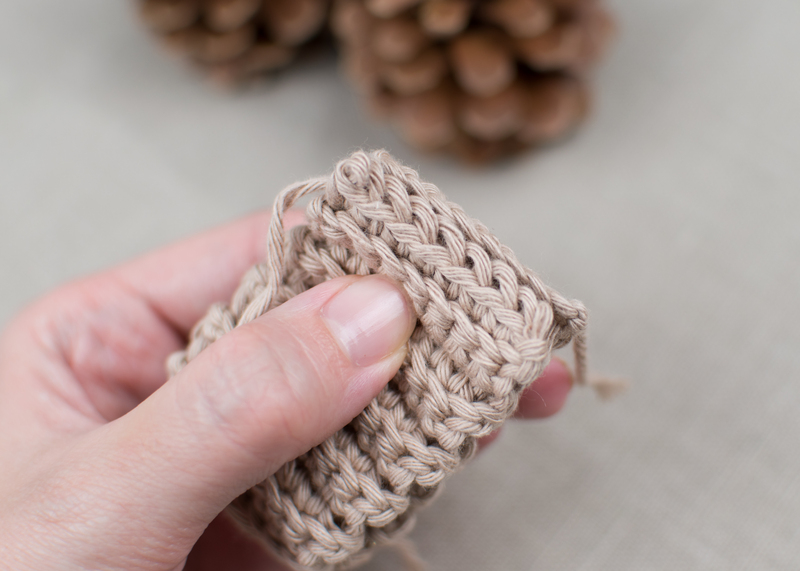 Take a small amount of both shades of yarn and start wrapping both strands at the same time around two of your fingers. More times you wrap the yarn around the fingers, fuller the pom-pom will be. 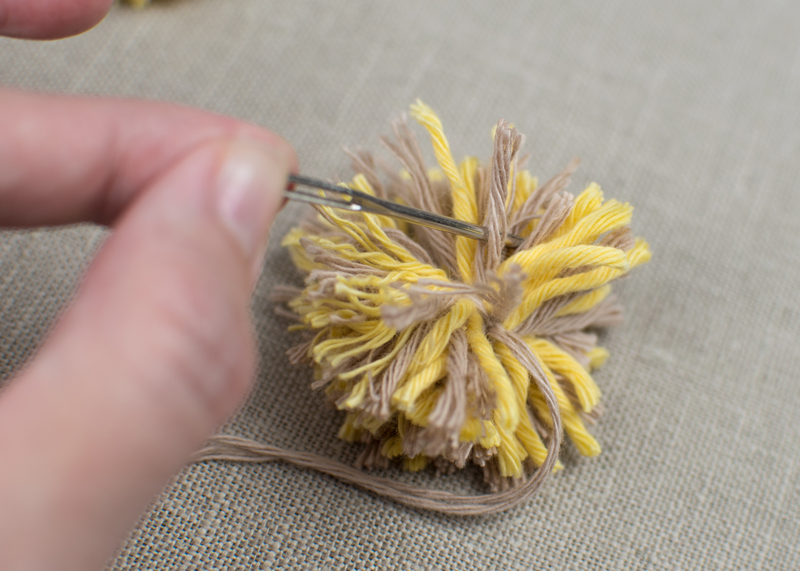 Now take another strand of yarn and wrap it around the middle of the pom-pom, make a firm knot. 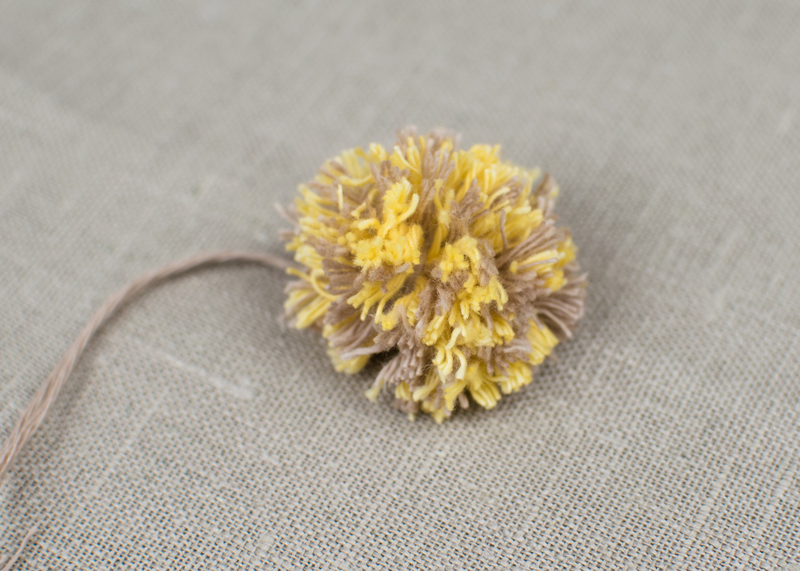 take a pair of scissors and cut all the yarn ends that are too long and make a nice and round pom-pom ball. 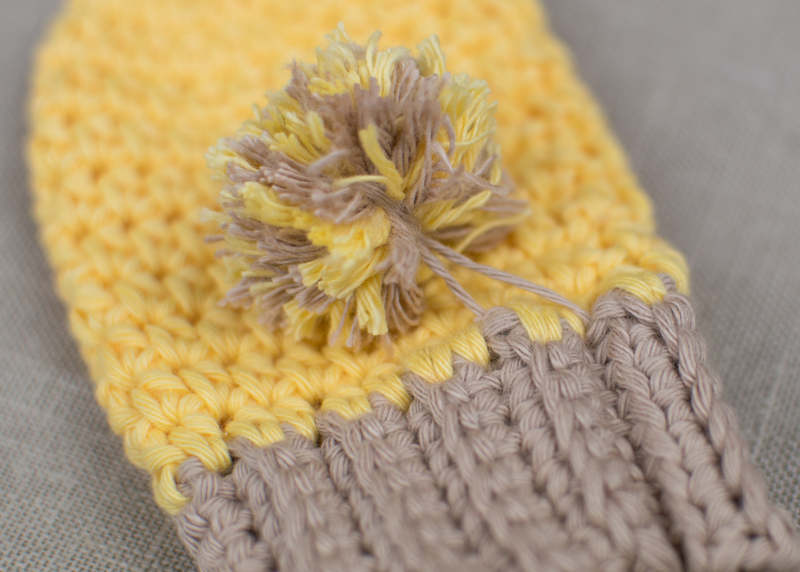 If you are using a cotton yarn, take a yarn needle to split the fibers to make the pom-pom look nicer and fuller. Now attach the pom-pom to the mitten. Repeat all the steps for the second mitten and you are done! Is there a PDF for the Minion Baby Booties that I could purchase? Thank you. Hi, Marie! Sadly not. At least not at the moment. Nice video and clear instructions.